BANGI, 16 Jan. 2012- Gifted students under the Permata Pintar programme will be taught using differentiated approaches most suited to each individual’s level of thinking to maximise their potentials. 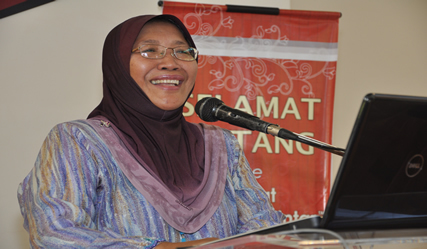 Director of the Permata Pintar Negara Gifted Students Centre (PPN) at the National University Malaysia (UKM) here, Prof Dr Noriah Mohd Ishak said methods devised have to be interesting not only to help them learn but also retain what they have learnt. She was speaking at the registration ceremony of the new intake for the programme at PPN today. A total of 128 gifted students aged 16 registered today for the two year programme. They will be taught differently from normal schools. Each student have to take a test, to gauge their knowledge on a particular topic at the beginning of each class. They will then be separated into groups with each group taught differently to maximise their knowledge at every lessons. The two year programme is designed to produce thinkers who can pave the way for innovations. They are taught to apply their knowledge to solve problems by being innovative. Apart from the academic programme the students will receive mentoring by researchers from the university. Their mentors will be selected based on their fields of interest. Dato’ Dr Sheikh Muszaphar Shukor Sheikh Mustapha is one of the mentors for a few of the students . After two years at the centre they will be given the choice to continue their studies overseas including in Ivy League Universities of the United States like Harvard and the Massachusetts Institute of Technology (MIT) should they meet the requirements. Deputy Director of PPN, Dr Melor Md Yunus; Head of Talent Management of PPN, Dr Siti Fatimah Mohd Yassin and the proud parents were present at the ceremony.ceremony.